If you've read our page on Kayaks generally you will have picked up that whitewater kayaks are relatively short and fat with plenty of rocker making them manoeuvrable but not necessarily easy to paddle in a straight line without some practice. With a few sit on top exceptions these kayaks have a cockpit that is fairly (to extremely) enclosed and allows the legs and hips to provide lots of control over the boat by close contact. The sitting position is such that the knees are positioned wide and close to the hull providing a stable sitting position in a type of boat that is naturally stable. 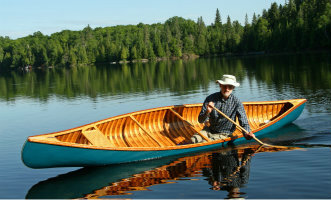 Many paddlers are first introduced to kayaking in a boat of this type on flat water where they can be used to learn all of the basic strokes ready for venturing onto rapids. 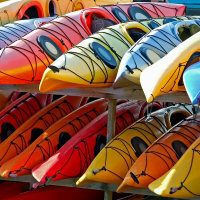 White water kayaks can generally all be used for a variety of purposes but different classes of boat have developed with specific characteristics for specific purposes. Do be sure to buy a boat that fits and fit it out to fit even better. Freestyle boats are fairly distinct and are designed for those who want a boat for playing on waves in a specific location pulling tricks and stunts. All the major brands have a freestyle boat in their range. These boats are very low volume and very short and as a result not very practical for putting in any mileage, however for spinning and surfing and standing on end they are perfect. They area dedicated boat for a dedicated area of the sport and will of course be much in evidence at freestyle and rodeo competitions and events. Examples of freestyle boats include Dagger's Jitsu, Pyranha's Jed, Liquid Logic's Freeride, Wavesport's Mobius and Jackson's Rockstar. The mid sized boats are typically around 215 litres in volume, and between 1.7m and 1.9m in length. If you have the patience to wait for the page to load check out the funky designs on these guigui-prod freestyle boats all light weight carbon kevlar construction boats. 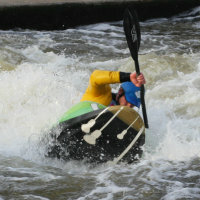 Most of the whitewater kayak ranges have another boat designed for similar sorts of play to the freestyle designs but with a bit more length. This makes them just that bit more practical for paddling down the river from A to B to C with A, B and C each being a nice bit of rapid for playing on. Typically these boats have no more volume than the freestyle boats so can still be used for a variety of tricks that involve spending quite a lot of time underwater! Because the volume is distributed along the length they are less chubby looking than their freestyle counterparts and look as though there is not a lot of room for chunky legs! Example of these boats are Pyranha's Z.one, Dagger's Axiom and Wavesport's Fuse. These boats are more typically from 2m to 2.7m in length although Wavesport's boats are on the shorter side. Most of the ranges have at least one river running boat. These have more length and volume being around the 2.5m in length and 250 - 300 litres in volume ( again based on mid sizes). You would expect to be able to paddle your river running boat down white water stopping to surf waves, breaking in and out with ease, bouncing around in a stopper and generally enjoying the environment in a boat that is going to keep you as relaxed or hyped as the grade of water and your desire for thrills will allow. The length will allow you to paddle the slower sections of water with comfort and help you get the boat up to speed as you go for that big cross or want speed into a big wave. Creeking boats are not madly different in size to river runners. Typically, they might have a bit more volume, but they are designed to help you run steeper rivers with drops, waterfalls and bigger holes. You would expect your creek boat to help you boof with the bow clearing the water easily, plenty of manoeuvrability and stability when you need it most. These characteristics should ensure that your boat gives you ultimate confidence when the drops are big and the river is technical. Alongside the Riverrunners are a range of boats variously described as crossover, touring, treking etc. Each will have a blend of properties broadly based on a riverunner but maybe in the case of touring and treking kayaks being a little better on the flat cruising between rapids or set up with hatches to store equipment. Heading the other way they might be a blend between a river runner and a creek boat. Armed with what you have learnt here on this page you should be able to decipher the likely suitability of boats based on which range they come from and the manufacturers descriptions. 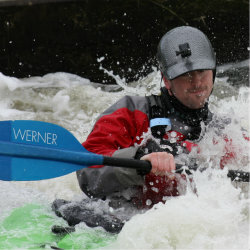 Many of the whitewater kayaks in the river runner / crossover / tourers categories are suitable as introductory boats for beginners and some models feature drop down skegs which can assist learners in getting these boats running straight or on a tour might be useful just to save on steerage for the more experienced paddler. 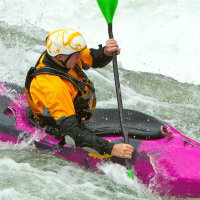 As we have said within the whole whitewater kayaks broad category are sub categories. To paddle whitewater in a canoe you need to research plenty of boat shapes. More of a team player? Then rafting might be the way for you to paddle whitewater. We recall the first time we really saw roto-moulded whitewater kayaks being paddled in the 1980s. We were paddling in the Alps in Austria and there was a group of Germans with their plastic boats paddling some big water. We had what we considered to be high volume boats mainly Snipes (compared to our very low volume slalom kayaks they were high volume) but we could see the advantages of the plastic boats immediately. Firstly they wouldn't have been spending the evenings mending their boats with fibreglass and duct tape like we were and secondly they seemed to be able to survive in big water with ease. Sue might have had a few less swims with the more modern boats around today especially with boats in sizes to suit the smaller paddler. However Mike would never have got so good at fixing boats! 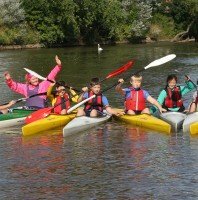 In our downloadable list you will find a few Sit-on-Tops designed for whitewater playing, A few boats described as Race boats with plenty of length for rapid descents and a number of craft designed especially for children. Look at the smallest models in each range for children as well as those specially marketed as youth boats. Amongst the major whitewater kayak brands are Dagger, Pyranha, Liquid logic, Wavesport, Jackson and Letteman please do let us know who we have missed. They all offer boats in most of the major categories often with more than one model in each area perhaps in different sizes. Differentiating between the brands comes down to a blend of the specific designs they offer, whether their sizes suit your physical build, their build quality, the style and quality of their fittings, the availability of demonstration boats to try out and of course price. Follow the links to their web pages where you will learn more about each specific range.